This coffee table book celebrates those who dared to stand for equal rights. From the 20,000 women who participated in 1912's Suffrage March along 5th Avenue ("a wonderful spectacle") to first female Supreme Court Justice Sandra Day O'Connor's first day in 1981 ("she suffers fools gracefully"), the history of the women's movement is rich with stories and significant progress. This coffee table book celebrates those who dared to stand for equal rights through a collection of New York Times articles, which begins with the Equal Rights Convention in 1866 and ends with the Time's Up movement in 2018. 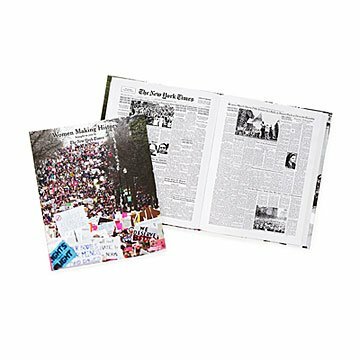 The cover features an image from Washington D.C.'s women's march, where, in the crowd of hundreds of thousands, "mothers marched with daughters and granddaughters," wrote the Times, "whole families, including husbands and sons, marched arm in arm." Introduction written by New York Times Gender Issues Editor Susan Chira. Made in Williston, Vermont. $5 from the purchase of this book goes to Women for Women International, a non-profit organization that provides practical and moral support to women survivors of war. Also check out A History of Civil Rights and A History of Gay Rights. 15" L x 12.25" W; 87 pgs. Perfect gift for Women's Activist friends as well as anyone interested in Women impacting our World. I gave it to my daughter-in-law as a birthday gift and she loves it!! The book is a great reminder and memory for women who participated in any of the recent women's marches as well as providing context for women's rights and how women have banded together to create change over time. It's reproductions of news articles but would be s bit better if the print weren't so small so you could more easily read the book rather than just have it be a coffee table page turner. My sister really enjoyed receiving this as a gift. I gave this to my Sister who loves having out of the ordinary coffee table books out to discuss with family and friends when she entertains. Women and men both have learned quite a few things from this book. My mother in-law loved this! My mother in law loved the book and had it lying on the coffee table with a magnifying glass. She shared memories of major events captured on the pages and even enjoyed the advertisements. The print is small, but it is obviously comprised of old photocopies contributing to the charm. This item was not what I expected - I should have read the details more closely. It is VERY large, and a thin volume. But the most important part is that it seems like everything was just photocopied into the book. The idea for this book is actually really cool, but the execution is poor. I thought the price was far, far too high for the quality of the book. This is not a "coffee table book" as I had envisioned. Ordered this book as a gift and received a defective copy, returned it and the second copy also had bubbling in the cover where the pages separated from the glue. This makes an incredible gift for yourself or for a fellow women's march participant! Great gift, will be read again and again. Paired it with a "Never the less, she persisted" coffee mug to complete the themed gift. Only complaint is the fine print, very small type.